A voluntary group from Wirksworth, Derbyshire, which provides safe drinking water and humanitarian aid worldwide to those in need has been honoured with the Queen’s Award for Voluntary Service – the highest award a voluntary group can receive in the UK. Aquabox is managed and run by the Rotary Club of Wirksworth. In recognition of the award, chairman of trustees Mike Tomlinson and his wife Dianne, a fellow Aquabox volunteer, attended a garden party at Buckingham Palace on Tuesday 24 May 2016 hosted by the Queen, where they met with other winners of this year’s award. Mr Tomlinson said: “Everybody connected with Aquabox is absolutely thrilled with this accolade, which recognises the hard work and dedication of all the volunteers who selflessly give up their time to ensure this vital aid goes to places where it’s needed most. Since its formation in 1992, Aquabox has distributed more than 105,000 boxes to crisis zones across the world. It recently sent 4,500 boxes to Turkey and Lebanon to aid Syrian refugees, and shipped almost 2,000 boxes to earthquake-hit Nepal. The plastic boxes consist of a water-filtration unit, cooking utensils, hygiene equipment, tools, shelter materials, baby clothing and educational items. The charity relies entirely on donations and fundraising to purchase the boxes and their contents. 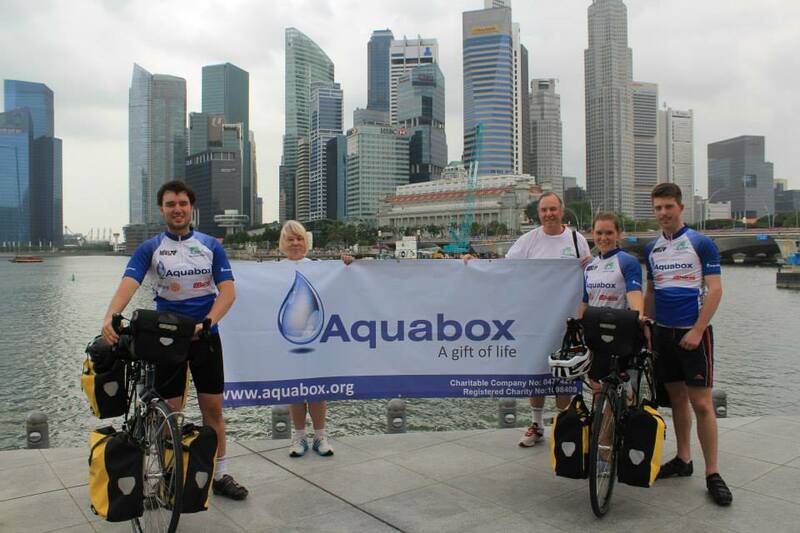 Aquabox is one of the 193 charities, social enterprises and voluntary groups to receive the prestigious award this year. The number of awards given this year is slightly higher than last year, showing that the voluntary sector is thriving and full of innovative ideas to tackle community challenges. The Queen’s Award for Voluntary Service is the highest award given to local volunteer groups across the UK to recognise outstanding work with their communities. The awards were created in 2002 to celebrate the Queen’s Golden Jubilee and winners are announced each year on 2 June – the anniversary of the Queen’s Coronation. Aquabox will receive the award from William Tucker, the Lord Lieutenant of Derbyshire, later this summer. On Wednesday 11th November 500 humanitarian aid packages will be loaded into a 40 foot container bound for Eastern Turkey to provide safe drinking water and alleviate the suffering of the Syrian refugees. The 500 Aquaboxes which contain an Aquafilter – which turns contaminated water into safe drinking water- along with over 70 items of humanitarian aid, have been assembled and packed by our team of over 80 volunteers at the Aquabox Depot in Wirksworth over the past 2 months. The Aquabox is designed to support a 5 person family unit and could therefore support 2500 refugees and provide at least 900,000 litres of safe drinking water. To ensure that the aid reaches those who have the greatest need, boxes will be distributed by our trusted partner Hand in Hand for Syria. In addition to the Syrian response, Aquabox despatched a further 500 boxes to the Philippines on the 6th November to support families caught up in the typhoon that recently struck the islands. Aquabox is a Rotary supported community charity based in Wirksworth managed, almost entirely, by volunteers drawn from the Derbyshire and Nottinghamshire region. These volunteers come to the Cromford Hill depot 4 days of the week to assemble and test the Aquafilters and to pack the Aquaboxes ready for despatch when a catastrophe strikes. Aquabox has been in operation for 22 years. During this time it has despatched over 100,000 Aquaboxes to countries and regions of the world where a manmade or natural disaster has struck. Aquabox has been working in Nepal for nearly two years and in that time has despatched over £100,000 of its humanitarian aid Gold boxes and Community Filters to already desperate communities and families there. There is now a massive international aid effort to help meet the needs of those affected by the tragic earthquake and its aftermath that has devastated much of Nepal in the last few days. Aquabox has already set in hand it’s own response to this emergency situation. Reports so far indicate that a minimum of 4000 people have lost their lives. Many more have been injured and have had their lives turned into turmoil. Regrettably, these numbers is likely to increase as emergency services and aid workers reach more remote areas. In any emergency, it is the poor and the remote people and communities who are affected most. Damage to infrastructure has been considerable. This makes the emergency services and aid responses all the more difficult. Ironically, the sheer scale of the international aid effort means that getting aid into the country is itself a problem. The earthquake is truly a natural disaster on a massive scale. Aquabox has been sending its Gold boxes and Community Filters to Nepal over the past 18 months. Working with these Fire and Rescue Service of the South West of England and local Rotary in Nepal, Aquabox’s aid has already made significant contribution to promoting safe water and humanitarian aid supplies in remote areas in Nepal. Aquabox has established, reliable distribution partners in area already. Aquabox now has ready 180 Gold boxes and 20 Community Filters ready and available for immediate air-freighting to Nepal when once flights are permitted. Since completing the previous quarter’s shipments with 200 Aquabox Golds being sent to Rotary District 3292 Nepal in March, AQUABOX has continued its busy schedule. In the past three months, our volunteer teams have packed 700 Aquabox Golds, with our volunteer AquaFilter assembly teams ensuring that each had a fully operational AquaFilter Family included in the box. All together, these boxes have provided emergency humanitarian aid to a minimum of 3.500 people and our AquaFilters will each produce a minimum of 16, 000 litres of safe drinking water. In detail, we shipped 100 of these Aquabox Golds to Uganda, for distribution by our long standing partner organisation, CART. This Yorkshire based, voluntary charity also undertaken for a further 100 Aquabox Golds sent to Rwanda. Both countries remain badly affected by the aftermath of unrest and fighting, and CART’s work in supporting communities and offering shelter and education to children is as important today as it ever was. Aquabox’s humanitarian aid is a vital part of CART’s on-going commitment to these communities. Aquabox also shipped during this quarter 500 Aquabox Golds to Turkey, working with the UK-based Muslim Aid organisation to ensure that this aid reached the most badly affected of the more than 1.5 million refugees from the civil war in Syria. The world has to keep up its efforts to support these often wholly innocent victims of these indiscriminate armed struggles, and Aquabox is proud to be part of those efforts. “The city is completely encircled. There is risk of being taken away or killed. The people are afraid… A fear which depresses, which paralyses, which kills… So the question is posed : what do we do ? Flee, as so many families have done? Stay in place paralysed ? Act ? What to do? Marist Blues are also supported by Rotarians in California, USA. In total, Aquabox’s efforts to help in these diverse humanitarian crises has required donation funding of £88, 750. THANKS TO ALL OUR VOLUNTEERS, SUPPORTERS and DONORS. Without this support, Aquabox would not be able to bring the Gift of Life to so many desperate people around the world. Rotarians in Wirksworth, the Aquabox mother-club, are giving their full support and practical help to two Peak District men undertaking a gruelling New Year Challenge. Long-distance cyclists David Cook and Paul Cave have embarked on the most challenging expedition of their lives, a 9000 mile gruelling charity ride through nine countries in South East Asia, to highlight the plight of some of the world’s poorest people and the efforts being made by international aid agencies to improve their quality of life. Both recent Honours graduates, the pair met while studying at Sheffield University.The expedition will take the team from Singapore to Mumbai though Malaysia. Cambodia, Vietnam, Laos, Thailand, Myanmar, Bangladesh, Nepal and India. “It is going to be a tremendous challenge but we have been planning this expedition for some time and are confident we shall succeed,” said Dave who, with Paul, has already undertaken long-distance charity rides in the UK, Europe and Australia. Primary objective of the expedition is to document, on film and in the social media, life in the countries through which they travel and the work being undertaken by international aid agencies to improve the lot of local people, many of whom eke out a miserable living in the most basic of conditions. A secondary aim is to raise funds for UNICEF and the Rotary Club of Wirksworth’s internationally-acclaimed Aquabox project which provides clean water for communities affected by man-made or natural disasters. “The expedition will give us a unique opportunity to raise money for Aquabox and help to promote positively the work of some charities whose humanitarian activities often go unnoticed,” said Dave. Former Lady Manners School student Dave is the only team member who will ride the entire route. With him and Paul on the expedition as drivers and support specialists are Sheffield creative media student Joseph O-Connor from Norton College in Sheffield who will co-ordinate film production, Herefordshire marathon runner and rower Chris Jones, and Arja Grenager Soermo from Lagesund in Norway who will also act as media communications officer. The team have now arrived in Singapore where it collected its support vehicle and other vital equipment, before the expedition proper sets off later in January. Though the major costs of the expedition are being funded by individual team members and specialist supporters, the group will have the backing of Rotary International throughout the ride. As is the case with all relief agencies, Aquabox is working hard to support those millions of Philippine people effected by the tragic and devastating typhoon Haiyan. Our hearts and very best wishes go out to them. Thanks to the efforts of our volunteer teams, we have prepared 100 Community Filters for immediate airlift to the Philippines and onward distribution to effected areas. This will not be an easy or speedy task. In the effected areas, little if any infrastructure remains operational, making any and all aid problematic. However, Aquabox believes that y working with its Rotary partners at District level in the Philippines its aid will best be delivered to those needing it. Local people know the terrain, the language and culture, and “the system” at local level so much better than might outsiders. But Aquabox has been and will remain busy in other regards, too. Since August of this year, Aquabox has despatched 1500 Aquabox Gold boxes to support those effected by the conflict in Syria, working with our long established, internationally recognised distribution partner organisation, Muslim Aid. 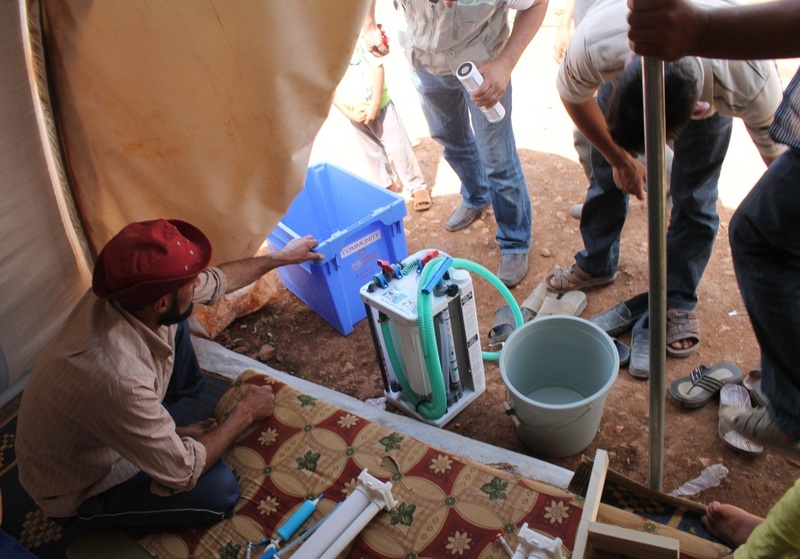 Aquabox, in addition, has deployed 60 of its Community Filters (each producing a minimum of 600,000 litres of safe and clean drinking water) direct into communities within Syria. The UNHCR estimates that there are twice as many people inside the boundaries of Syria effected by the conflict (more than 4 millions) as there are refugees from it in surrounding countries, such as Lebanon, Jordan and Turkey. Aquabox is one of the very few international agencies to have distributed its aid directly in Syria. Aquabox had also distributed 400 Aquabox Golds (each containing an AquaFilter family unit, of course) directly to support families and schools in Malawi, working with our distribution partner, Christian Africa Relief Trust. ALL of Aquabox’s operation depends on the active support of its volunteer teams, assembling our Filters and packing our Gold boxes, and undertaking the various logistics and administrative tasks necessary for the delivery of its life saving aid. None of this work would be possible without the continuing and generous financial support from its donors, including many Rotary clubs within RIBI. Every penny of money donated to Aquabox goes to directly support its aid. Aquabox has no salaried staff and only minimal fixed overheads. THANK YOU TO EACH AND AND DONATE TO AQUABOX, still after 20 years of operation a Rotary charity. At present, the Aquabox website http://www.aquabox.org/ has limited functions, as it is undergoing re-design, but online donations can be made through its “Support Aquabox” pages. Updates on Aquabox’s operations can presently provided by mini-blogs on Facebook; search under Rotary:Aquabox. WE HAVE DESPATCHED 1900 BOX ‘GOLDS’ IN JUST 5 WEEKS. NOW THE DEPOT IS BARE…. Thanks to the efforts of our more local volunteers, and of our supporters from around the UK and the wider world, we have emptied the depot of Aquabox ‘Golds’. Perhaps you saw Rtn Mike Tomlinson, Chair of Aquabox trustees, on a recent BBC tv East Midlands Today report on the work of the charity. We have despatched this week 100 ‘Golds’ to the Cameroons, in partnership with CART – one of our long standing distribution partner organisations. But, don’t worry – our volunteer packers and Family Filter assembly teams have already started to ‘build back’ our stock, ready for future humanitarian aid shipments, helped most recently by two youngsters who are volunteering at Aquabox as part of their Duke of Edinburgh’s Award community service project. And we need those boxes. We have requests for Aquaboxes for Rwanda, for Turkey, and we anticipate for those areas of India likely to be soon effected by the typhoon forecast to hit its eastern states. Lots done. Lots to do. YOU can help by making a donation to Aquabox today. Please see our donation page on the aquabox.org website.